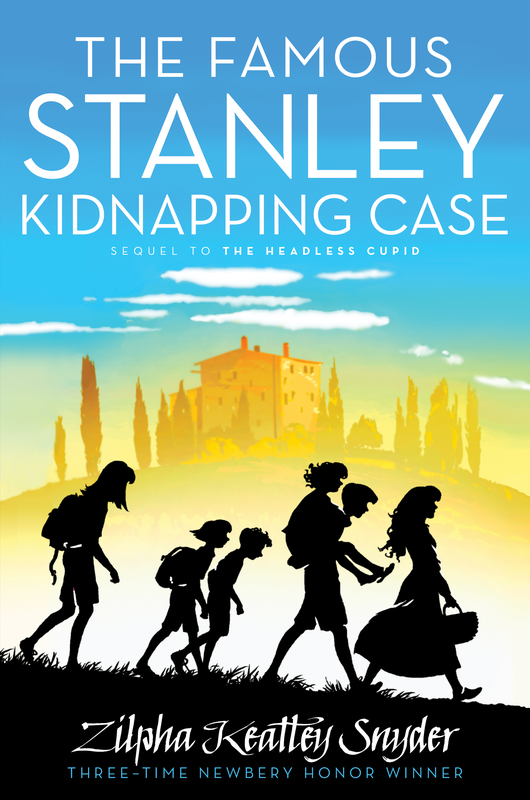 Five stepsiblings must escape their foreign captors in this breathtaking second book in the Stanley Family series, a companion to The Headless Cupid, from three-time Newbery Honor winner Zipha Keatley Snyder. The Stanley family is moving to Italy! David, Janie, and twins Esther and Blair are thrilled. But their moody stepsister Amanda, thwarted from spending time in California with her father, spends the trip alternately moping or boasting about how rich her father is. And precocious Janie translates everything Amanda says to all the neighbors. But such bragging does not go unnoticed. One terrible night, the children are kidnapped. David tries to make friends with the kidnappers to protect his family. But that’s hard to do when Janie lectures them on how to write a ransom note and Esther complains about the terrible food. Can David and Amanda use their siblings’ hijinks to outsmart the kidnappers? None of it would have happened if it hadn’t been for Molly’s Italian uncle, so the very beginning was way back in February. David remembered the beginning very well, because for just a minute, it had scared him half to death. It all started on a cold drizzly afternoon when he and Amanda had been, as usual, in the midst of some kind of an argument. They’d gotten off the school bus together and walked down the long curving driveway that led around to the back of the big old house and, still arguing, slammed through the back door into the kitchen—and found Molly crying at the kitchen table. The crying, by itself, wouldn’t have been too much of a shock, because Molly tended to cry quite a bit for an adult person. David had seen her cry over a burned dinner—which was the way Molly’s dinners turned out fairly often—or because she’d messed up a painting she’d been working on. But that was red-faced, angry crying that usually got mixed up with laughing at herself for being so ridiculous. This was different. When Molly’s face came up off her arms, it looked terrible: pale and swollen and awfully sad; and immediately David felt himself going stiff and cold with fright. Amanda, however, was so busy winning the argument that she didn’t even notice until David said, “Molly?” in a shaky whisper. When Amanda finally looked at her mother and said, “Mom? What is it? What happened?” she sounded surprised and worried, but even then not really scared. Not the way David was. It wasn’t until later, when he’d had time to think about it, that David understood the difference. He decided then that Amanda’s reaction was only natural—but so was his. Probably most people who were thirteen years old, like Amanda, just naturally felt that really terrible things only happened to other people—in the newspapers or in some other town or country. So even when she saw Molly’s face and knew something bad had happened, she wasn’t really frightened. David, who was actually almost a year younger than Amanda, would probably have felt the same way, except that his own mother had died when he was nine years old; and after something like that happens, you’re just not as sure anymore. So when he’d first seen Molly’s face, he hadn’t been sure that something hadn’t happened to—Dad, maybe, or one of the kids. But then Molly said it was her uncle—that Uncle Sid had died in Italy—and suddenly David felt as if something huge and cold in the middle of his chest had broken up into warm trickles of relief. Which would have been a good feeling, except that right away he started feeling guilty for being so glad about Molly’s poor old uncle. Particularly when Molly was obviously feeling absolutely terrible about him. All the Stanley kids had heard quite a bit about Uncle Sid since the summer before when Molly had married Jeffrey A. Stanley, who was their father. Uncle Sid had been an artist like Molly, and a bachelor with no family of his own to take an interest in; so when Molly was a kid, he’d been almost a second father to her, teaching her about painting and giving her lots of advice about what she ought to do. He’d always been crazy about Italy and spent part of every year there, so Molly always called him her Italian uncle, which he really wasn’t, since Molly and all of her relations were more Irish than anything else. But for almost as long as Molly could remember, Uncle Sid had been telling her she should go to Italy to paint and study art. He had told Molly that she had a tremendous amount of talent, much more than he had, but that she would never get to be a great artist and fulfill her destiny if she didn’t go to Italy, which was the birthplace of art and culture and civilization and nearly everything else that you could think of. He’d kept on urging her to go, even offering to help with her expenses, until she decided to get married to Bryan Randall, Amanda’s father. That had been a long time ago, almost fifteen years, and soon afterwards Uncle Sid had moved to Italy for good. He went on writing to Molly, though, scolding her for wasting herself and her great talent and telling her that she should never have gotten married. Eventually she must have started agreeing with him—or at least, as she’d told David once, she agreed that she shouldn’t have married a wheeler-dealer Hollywood PR man—and so finally she’d gotten a divorce. Uncle Sid had been very pleased when he heard about that, and he’d started urging her to bring Amanda and come to live in Italy. But then, when he heard that Molly had gotten married again, and this time to a college professor with a whole ready-made family, he’d finally given up entirely—in disgust, Molly said. But now he was dead, and Molly hadn’t realized just how much he meant to her until the telegram came that afternoon. After she told David and Amanda about it, she put her head back down on her arms and cried again with huge shivering sobs, like Janie at the end of a tantrum. Except you could do something about Janie, such as ignoring her or whispering to somebody so that she had to shut up to listen. But Molly’s crying was different, and there wasn’t anything David could do except stand around feeling helpless and try not to let Amanda see his face. Not that he was crying about somebody he’d never even met. It was just that Molly’s crying seemed to be catching—like when someone yawns. Fortunately Dad came home not long afterwards, and David was glad to let him take over the job of cheering Molly up. For a few days Molly wasn’t herself at all, very quiet and preoccupied. Dad must have noticed it, because he got everyone, including Amanda, together and gave a lecture about how Molly was going through a difficult time and needed peace and quiet, and how everyone could help. And how he’d better not catch anyone being uncivilized or else he might forget himself and resort to some old-fashioned negative reinforcement. David looked. You might guess by looking that Esther could be pretty one-track minded and that Blair was a little spacier than most four year olds, but Amanda ought to know by now that the way Janie looked had absolutely nothing to do with what she knew—or what she was thinking, or what she might be going to say or do next. It was as good a definition as most people a lot older than seven would have come up with, but Amanda only shrugged and walked away. Anyway, the lecture must have made a definite impression because everyone was particularly good for the next few days, or if not good, at least quiet. David and Amanda managed to have most of their arguments in places where Molly wouldn’t hear them, and even Janie had an amazingly quiet tantrum when David wouldn’t let her kick Blair for feeding a special strawberry she’d been saving to his pet crow. After a while Molly began to be cheerful again, and nothing more happened for several weeks. But then David and Amanda came home from school one day and found that Molly had been crying again, only this time it was different. Molly’s eyes were red, but this time she seemed more excited than sad, and she wouldn’t tell them what had happened. “Not until Jeff gets home,” she said. “Wait until Jeff gets home.” So they had to wait, sitting in the kitchen, raising their eyebrows at each other, while Molly bustled nervously around trying to start dinner but mostly going in circles and forgetting what she had started out to do. At last Dad walked in the door loaded down with books and papers, and Molly ran across the room and threw her arms around him books and all. “Oh Jeff,” she said. “We’re all going to Italy.” The way Dad stared at her when he got through grabbing at falling books and papers, it was pretty obvious that he couldn’t have been much more surprised if she had said, “We’re all going to the moon.” He went on looking surprised and puzzled for quite a while after she started explaining what she meant. The explanation didn’t make much sense at first to David, either. Just a bunch of stuff about “dear, sweet, stubborn old Sid” and how he never gave up until he got his way, and legacies and stipulations and Italian inheritance laws. But at last she slowed down and began over at the beginning, and it all started to make sense. Molly wasn’t standing on her tiptoes the way Janie did when she was telling something particularly exciting, but you got the feeling she was about to. For a long time Dad only nodded, looking very solemn and thoughtful. Then he asked to read the letter. When Molly got it for him, he sat down at the kitchen table and read it very slowly and deliberately, while Molly and David and Amanda stood around the table watching him. At last he put it down on the table and smoothed it out very carefully with both hands, then looked up grinning. It was suddenly obvious that he was just as excited about going to Italy as Molly was. Dad began to talk then—about people who might be able to take over his classes and leaves of absences and sabbatical years and difference of pay leaves. And Molly brought up buying a new car in Europe and charter flights and whether to fly directly to Italy or perhaps to London or Paris first—and it all started to sink in. David began to realize it really was going to happen, and it was a very strange feeling. The Stanley family hadn’t traveled much at all since he was old enough to remember. He’d never even thought about visiting a foreign country, except maybe Mexico or Canada. But now it seemed like a very interesting thing to do. To start with, flying across the whole country and the Atlantic Ocean in a 747 would be pretty exciting; and then to actually live in a totally different country, where people spoke another language and did all kinds of things differently might be. . . . He was just beginning to get some ideas about what it might be like when something hit him in the ribs. It turned out to be Amanda’s elbow. “Bye-bye, David,” she said. “What do you mean ‘bye-bye’?” he asked her. Dad and Molly were so busy making plans that they didn’t seem to have noticed, but Amanda was staring at them with squinted eyes and her mouth pulled down in the corners, the way she used to do all the time—and still did, only not quite so often. “Well, so are you,” David said. “Not necessarily. I could stay with my father.” Amanda’s father lived in a really plush apartment house right near the ocean in Santa Monica, and every once in a while she went to visit him. But usually only for a few days at a time during vacations. At first, right after Dad and Molly were married, Amanda had talked a lot about how great her father was and how crazy he was about her and how she hated Molly, and how the divorce had all been Molly’s fault, and how she would rather live with her father. But things had changed after a while, and Amanda had started speaking to her mother again. Most of the time, lately, she seemed to feel okay about the rest of the family, too, including David. Most of the time, but not always. Molly didn’t say anything for a minute, and when she did, she didn’t sound excited anymore. “You don’t want to go to Italy, then?” she asked. Molly turned and looked at Dad, who was staring at Amanda with the expression on his face that always made David feel uncomfortable, whether it was meant for him personally or not. “Yeah,” Amanda said. “I know.” She got up, gathered up her books and went out of the room. "Wholly entertaining, a work of zip and polish." "Hilarious but pithy as well." "Crackling with the Stanley family's distinctive charm and energy." "Scary entertainment and a good look at Italy."